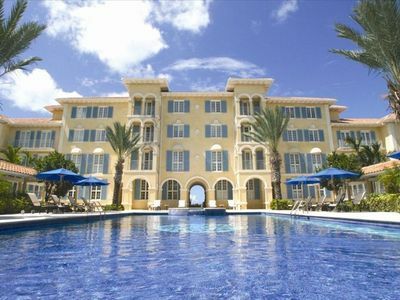 Crystal Sands Villa! BEACHFRONT! 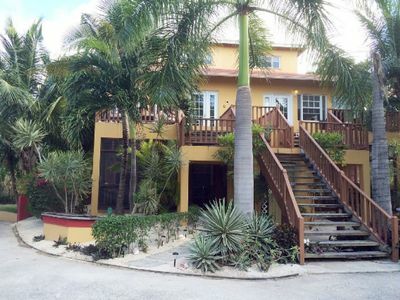 Sandy White Sapodilla Bay Beach! Great Value! $100 AC credit if you return your completed and signed reservation agreement within 24 hours! 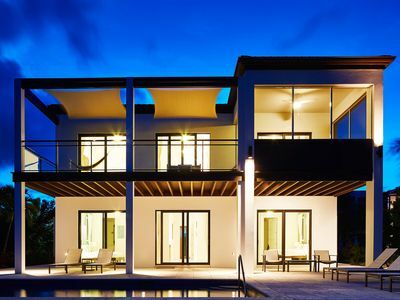 Crystal Sands Villa on Sapodilla Bay Beach is unbelievable! 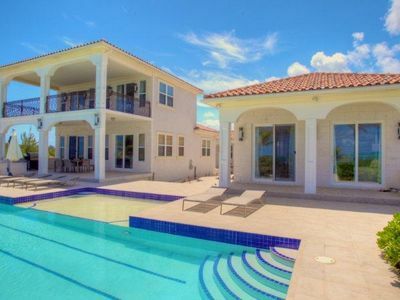 The Villa's setting is amazing!!! 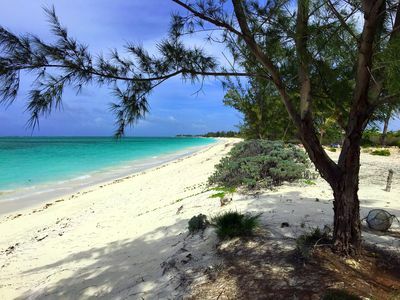 This southernmost beach on Providenciales is a cove protected from the wind by the surrounding points. 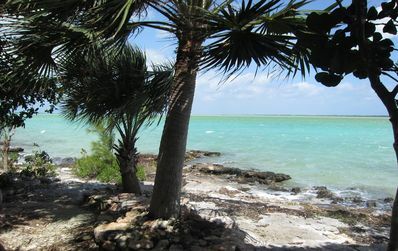 It offers shelter for sailboats, many of which moor just off the shore, creating the most picturesque view imaginable. The water is crystal clear. Its aqua tones bounce off the summer clouds and continually display an aura of colors. The beach’s crystal sands sparkle in tranquility! Sunsets are indescribable. Bring your camera. You will want to capture your friends and family in this magnificent setting! MULIT-FAMILY FUN: The villa is perfect for large families who want to vacation together, but who desire a bit of personal space, as well. It is also perfect for friends who love to travel together, yet have their own space. 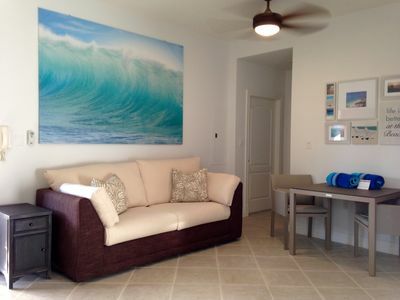 VACATION COMFORT: Large open great room! Fabulous views! Modern, fully equipped kitchen! Dining inside or outside! Bedrooms with a beach view! 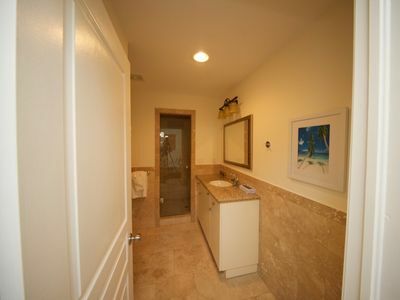 Spacious baths with walk-in showers! Fifty foot covered patio and balcony! Private pool area! Large shady palapas! Beachside palapas! Comfortable loungers! Tropical gardens! CONTACT US, send emails and ask questions BEFORE you Request to Book. Although the calendar is automatically marked when a reservation is made through the Homeaway/VRBO system, we do occasionally mark the calendar ourselves. We do not want to disappoint anyone if we have inadvertently missed marking the calendar herein. We reserve the right to be very silly in our response to a Request which has not been discussed ahead of time! 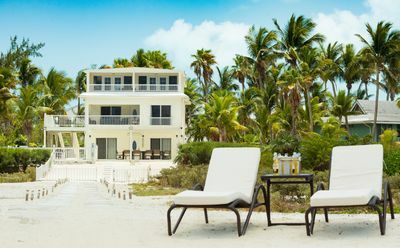 TERMS: We do require our own completed reservation agreement and the deposit prior to confirming a reservation, regardless of what the Homeaway/VRBO generated correspondence indicates. 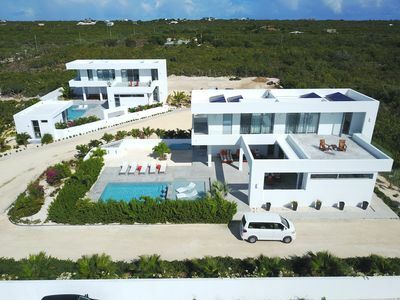 BEDROOMS: Crystal Sands Villa is one 4 bedroom, 4 bath villa which has two independent 2 bedroom suites. 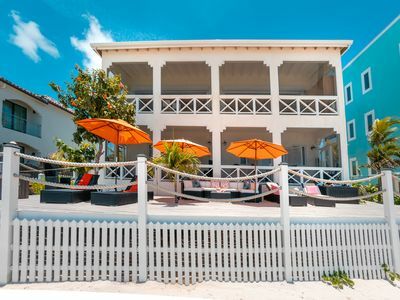 Each of the four bedrooms has a direct view of the beach! The rooms are large, open and airy. In the Beach Level Suite, a third room has two additional twin beds in a bunk bed! In the Penthouse suite, the Owners can obtain a rollaway bed for a child if requested in advance. Sleeps 10 in bedrooms. Recommend 8 adults max and up to 4 small children, if two are infants who sleep in a Pack and Play. 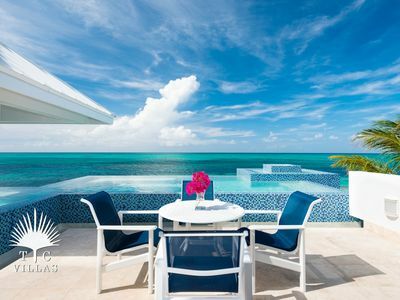 NON-SMOKING: Crystal Sands Villa is Non-Smoking. AIR CONIDTIONING OPTIONAL: Although tropical breezes keep the villa pleasant, air conditioning is available at extra charge for those who must have it! Conservation of electricity is encouraged. AIR CONDITIONING ESTIMATE: Guests are charged $0.75/kwhr used, a rate which is based on our historic costs. During the last year, our conservative guests who used AC set the thermostat on 85 degrees when no one was present in the home and on 78-80 degrees for sleeping. They spent $150 per suite on average, with a range of $114 to $479 for a week. The majority of our guests did not use AC at all during the Winter and Spring. Our home has a sub-meter which measures usage for AC specifically. Electricity on island is considerably more expensive than on the mainland. 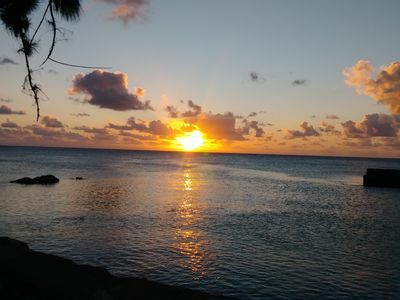 SURROUNDING AREA: Just a short walk to the east, on Sapodilla Hill, is the famous site at which shipwrecked sailors carved their names in stones. These stones still survive. The site is such a national treasure that replicas of some of the carvings have been made and put on display at the airport! Make it a point to include this walk while you are here. 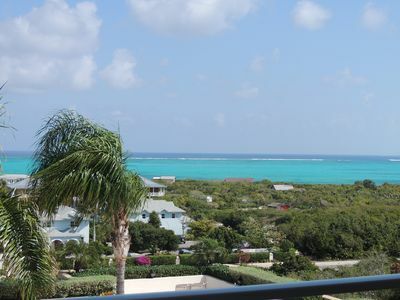 RESIDENTIAL: Crystal Sands Villa is located in an exclusive residential area of Providenciales. We have a lovely restaurant, Las Brisas, within walking distance. Other shops, restaurants, activities, sites and facilities are within an easy drive within a 10 square mile area. Renting a car is recommended. ACTIVITIES: One of the world’s top ten dive destinations * One of the best golf courses in the Caribbean * Diving * Fishing * Golf * Sailing * Parasailing * Horseback riding * Snorkeling * Swimming * Sunning * Hiking * Walking * Collecting Shells * Boating * Tennis * Very fine dining * Relaxing * Water skiing * Wind surfing * Visiting adjacent cays (pronounced keys) * Watching fabulous sunsets * Glow worm excursions * Conch farm tours * World Class restaurants * Scenic drives * Tours of Ruins * Beachcombing * Deep Sea fishing * Jet Skiing * Pier fishing * Sightseeing * Spa treatments * Channel fishing * Whale watching * Rock iguanas visits * Bird watching....simply RELAXING! OWNERS WHO CARE AND TAKE CARE! We loved Provo so much that we moved here! We take care of our own villa and we maintain it very well! We will greet you at the villa just after your plane arrives and personally answer your questions and help get you oriented! Please check with us about your individual needs and desires! 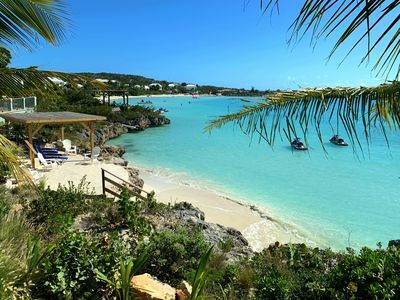 We want to help make your vacation the best you have ever had! 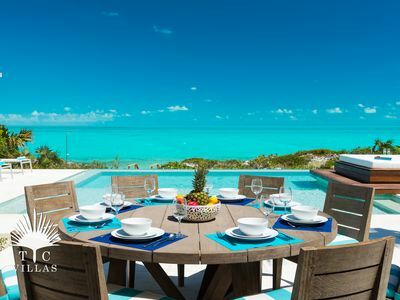 ACCOLADES: Crystal Sands Villa has recently been listed as 'Fodor's Choice' for the Turks and Caicos Islands. REVIEWS! REVIEWS! REVIEWS! REVIEWS! REVIEWS! ........Over 425 Five Star reviews across various listing sites! CHANGEOVER: Saturday ONLY. 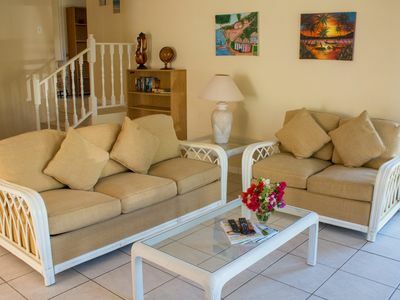 Our villa typically rents for seven night periods, beginning on Saturdays. We are flexible with last minute availability. Please contact us directly. PAYMENTS: Please note that we respond to our inquiries personally with our own email address, not with a rental company address. We use the Homeaway/VRBO online secure payment system. Call us by phone if you have any concerns about the authenticity of the response. 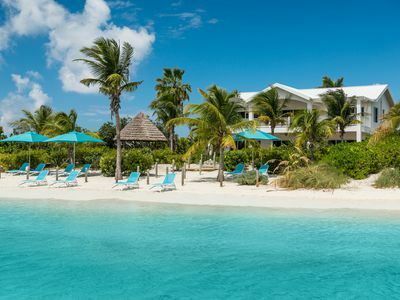 CANCELLATION: We do have a cancellation fee if a reservation is cancelled prior to 90 days before arrival. We offer no refunds within 90 days of arrival. We STRONGLY recommend “Cancel for Any Reason” insurance available from large, reputable insurance companies for anyone who has any reason to believe he may cancel at any time. Travelers can obtain such insurance; Owners cannot. You MUST have insurance in order to obtain a refund for any reason within the no refund period. 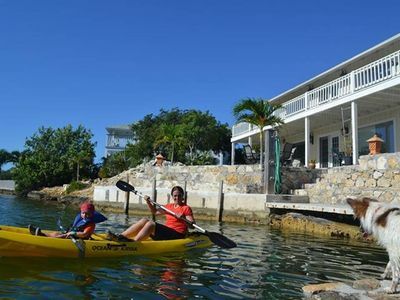 Great Family villa on the Water Near Grace Bay - Pool, Kayaks SUMMER SPECIAL! Beach Front! 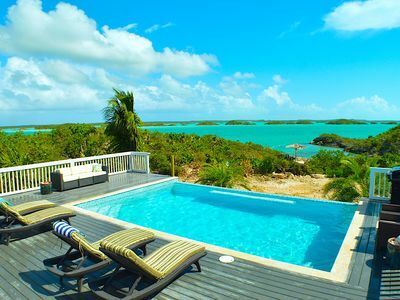 Beautiful Beach, Nice Pool, Amazing Ocean Views + Sunsets!